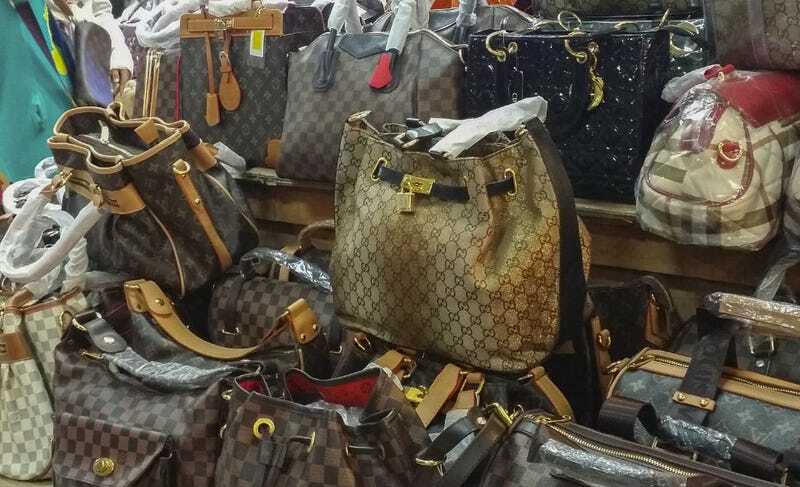 The NYPD raided a Queens warehouse Tuesday and seized over $2.2 million worth of counterfeit goods, potentially making Canal Street a lot less fun for tourists hunting for fake Michael Kors, or whatever. Displaying no sense of irony, the seizure was called "Operation Treasure Hunt." When it was time to take action, a fleet of cars made their way to Treasure Island Storage and officers entered the sprawling 1,100-unit facility while a few others remained outdoors guarding the various exits. When approached, the accused stopped cold, in some cases while dealing with customers. One suspect tried to nonchalantly close the grate to her storage unit, as investigators approached. The raid was put together gradually over the seven months, with investigators starting from the ground up. Writes WWD, "investigators initially put their search in motion by having undercover NYPD officers purchase a few items from the accused and then gradually earn their trust over time to buy more goods." Of course there are issues with counterfeiting—it's illegal, copyright infringement, and lord knows there's nothing worse than biters and idea-plagiarists (who are rampant in the mainstream fashion industry, as well). On the other hand, fake Gucci handbags and their ilk can be seen as flying in the face of the luxury goods industry, which generally caters to the bourgeoisie and inflates market prices overall. NYPD Captain Brian Sayre told WWD, "Companies are losing money because they're not getting these sales. I think if someone wants a Michael Kors purse they're going to buy one whether it's legitimate or counterfeit." The piece itself notes that if all the counterfeit goods seized in 2013 were the real deal, their retail value would have risen by 38 percent, a total of $1.74 billion. That's not a number to scoff at, but of course it's factoring in the concept that if the counterfeit goods did not exist, consumers would actually purchase the real deal, a point upon which I disagree with Sayre. It's not like most people buying knockoffs are simply cheapskates—the majority of them simply cannot afford to purchase a real Chanel handbag for anywhere from $1,500 and upwards. But these companies have done such a good job of creating a demand, marketing fantasy to everyone and attaching some kind of social worth to owning it, that you really can't blame anyone for falling into it and wanting to floss a label like their favorite movie star, for example. Welcome to late-stage capitalism, baby. Ugh! Image via AHMAD FAIZAL YAHYA/Shutterstock.